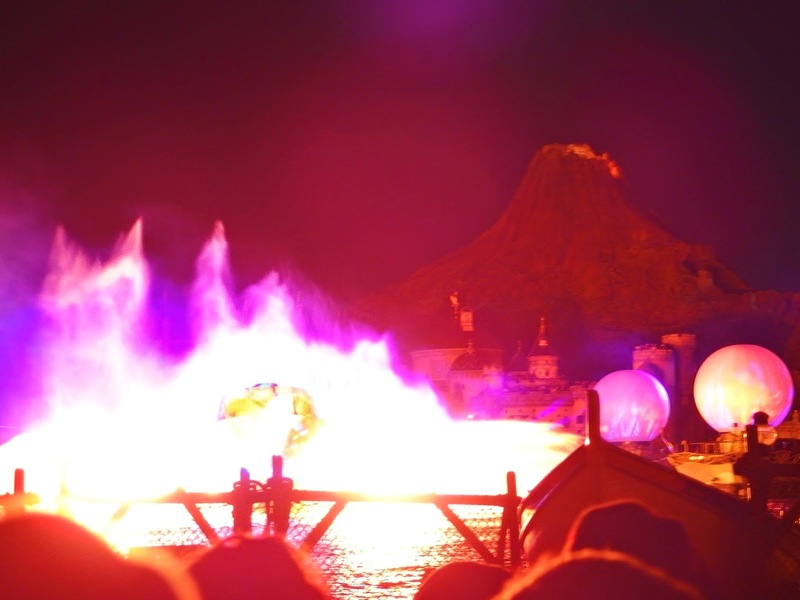 Fantasmic! 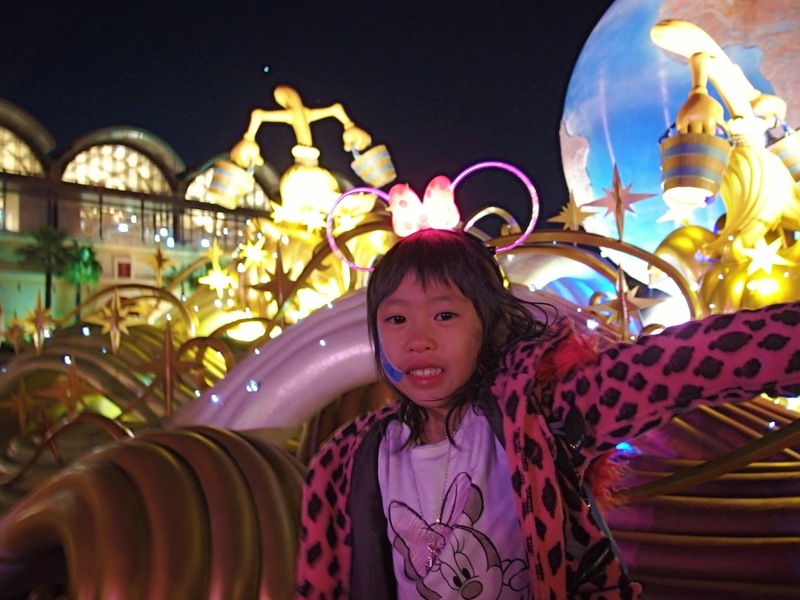 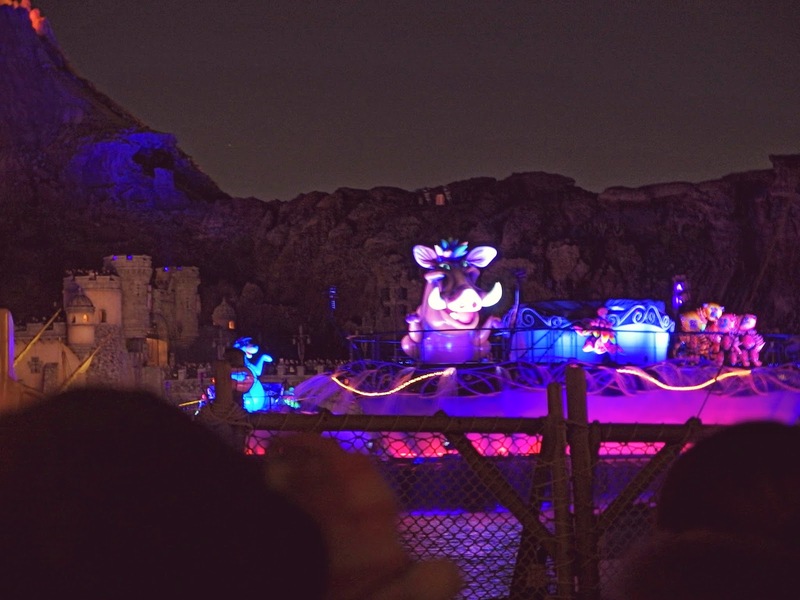 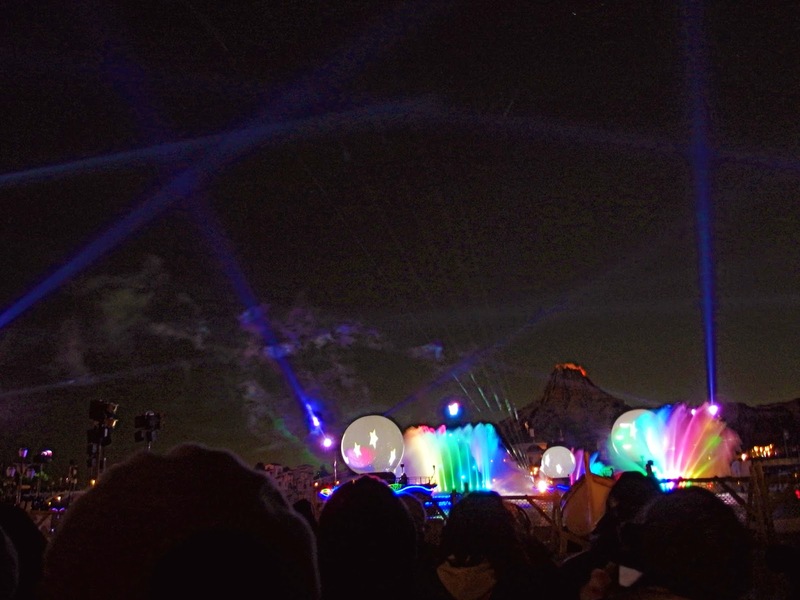 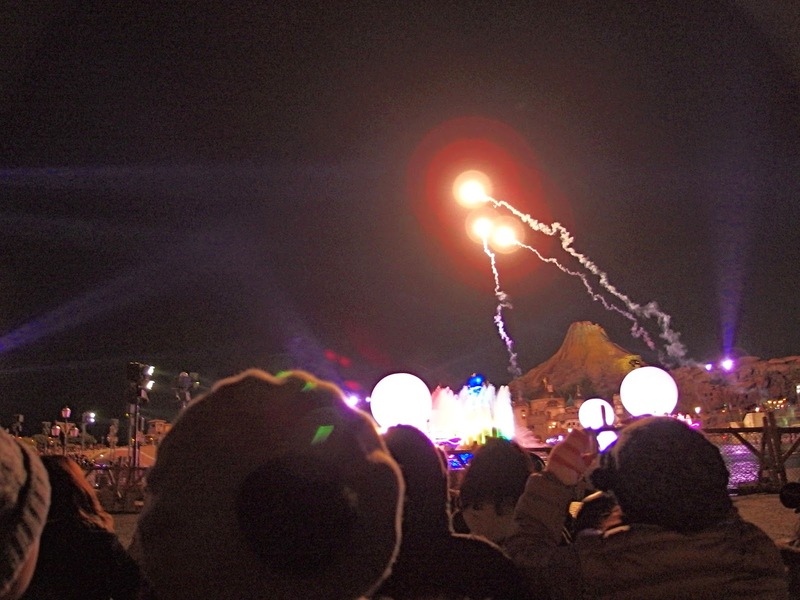 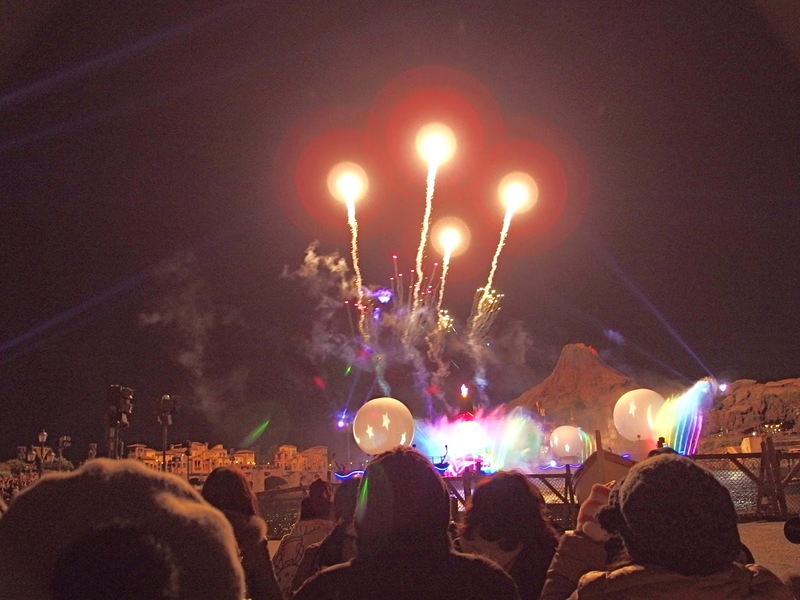 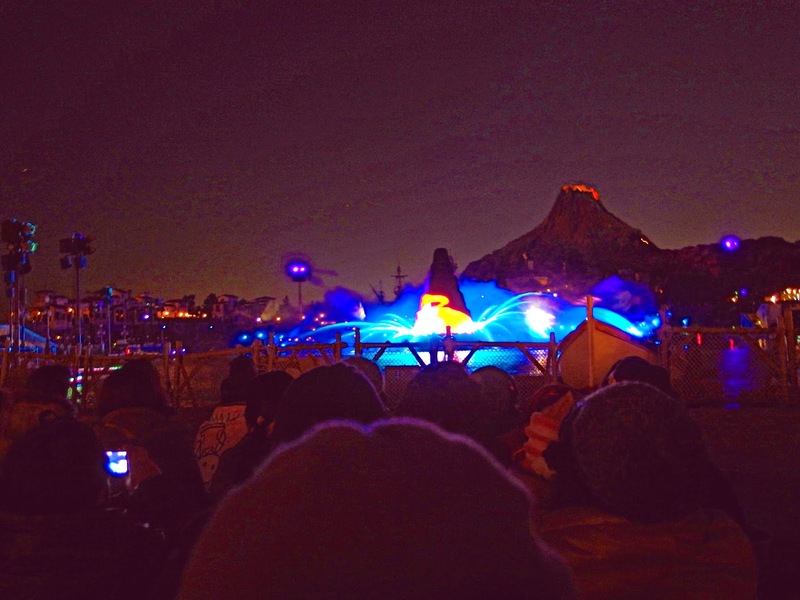 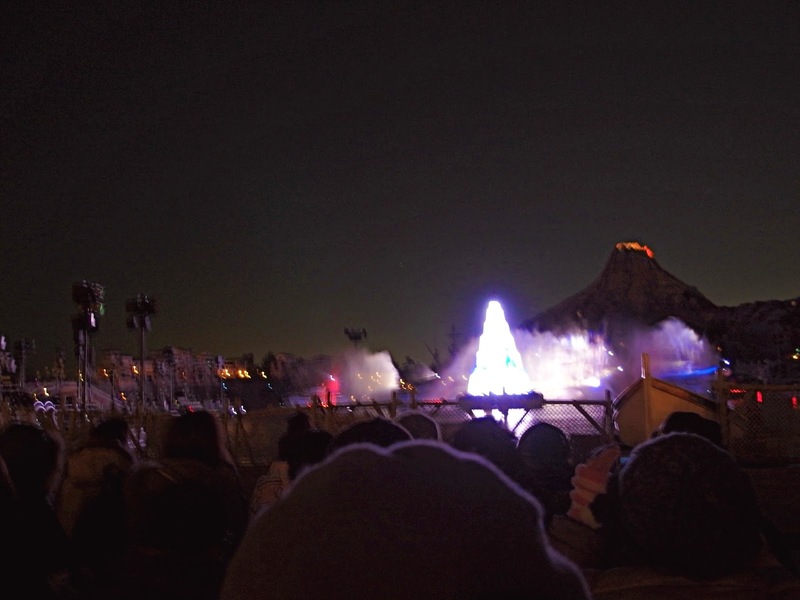 is a long-running nighttime show at both Disneyland in California and Disney’s Hollywood Studios in Florida, now recently added to Tokyo DisneySea. 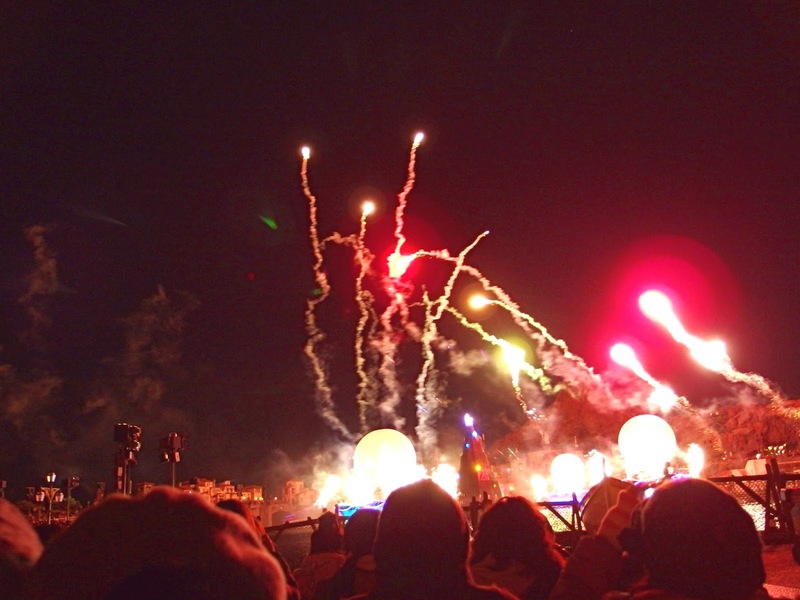 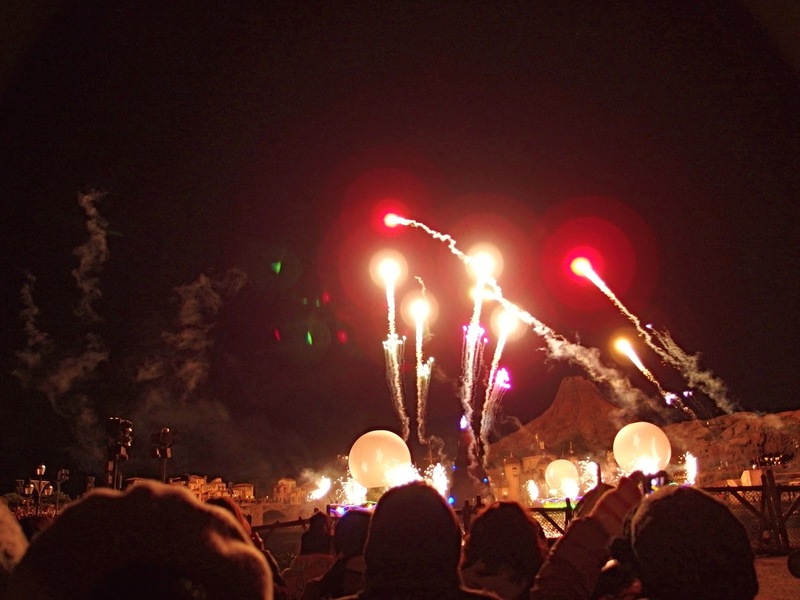 It originated at Disneyland in 1992 after Disneyland’s entertainment department was asked to create a nighttime spectacular involving water and fireworks to invigorate the space in front of the Rivers of America. 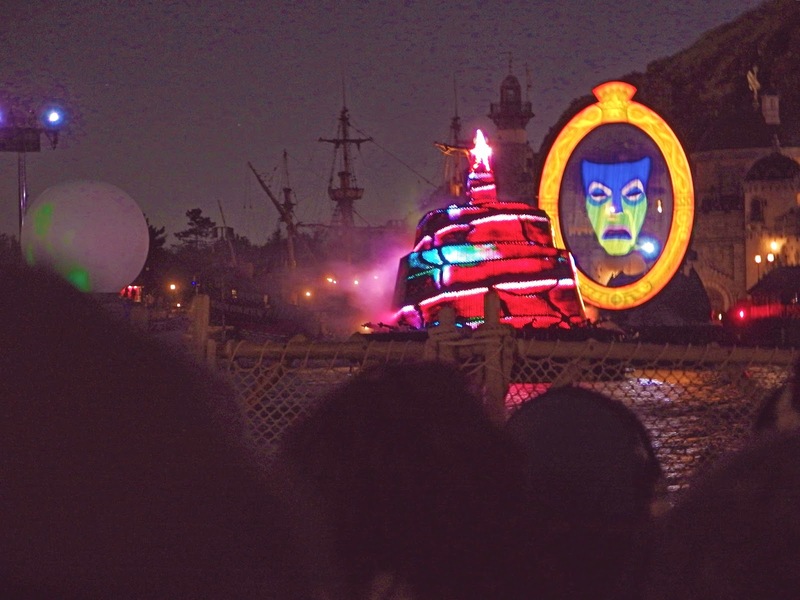 Disneyland Entertainment employed the resources of Walt Disney Feature Animation and Walt Disney Imagineering as collaborators. 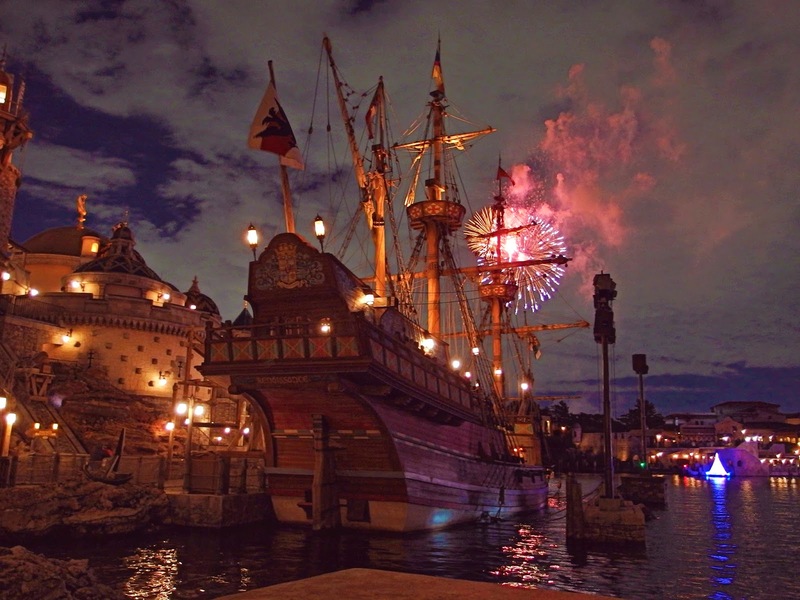 Much of the area around the Rivers of America needed to be reworked, including terracing the walkways to accommodate viewing and modifying part of Tom Sawyer Island so that it could act as a stage for much of the show’s live action. 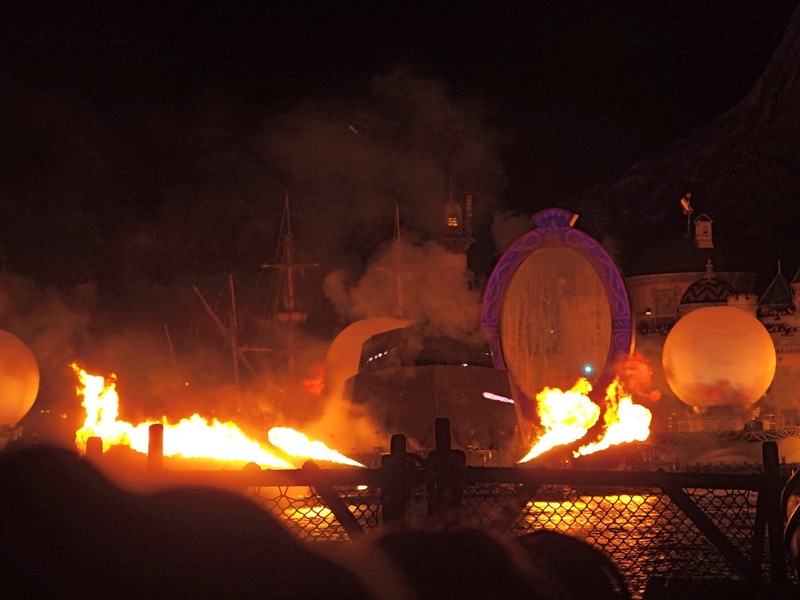 In 1996, Walt Disney Entertainment in Florida partnered with Imagineering and Feature Animation to bring a new version of the show to Disney’s Hollywood Studios (formerly the Disney-MGM Studios), featuring new animated and live action scenes. 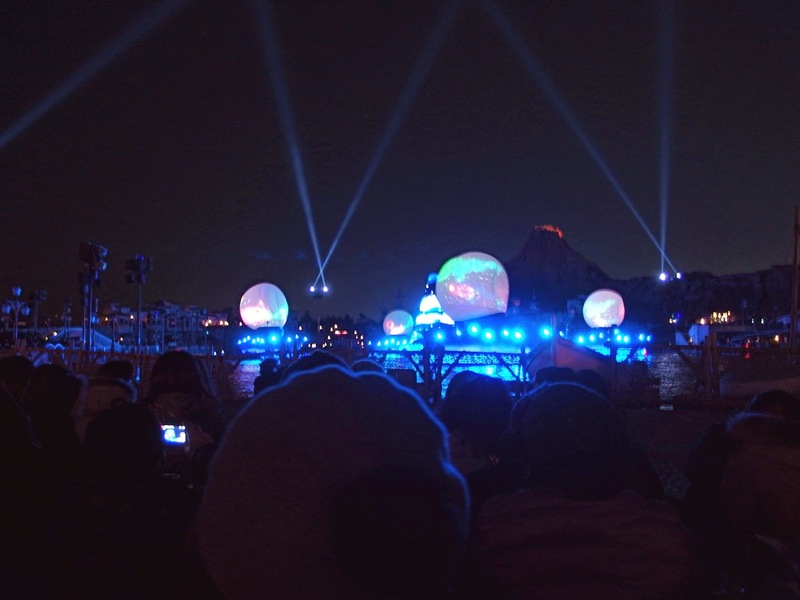 The Rivers of America at the Magic Kingdom was not conducive to a of the layout at Disneyland, so a new purpose-built 10,000 seat amphitheater was built at Disney’s Hollywood Studios. 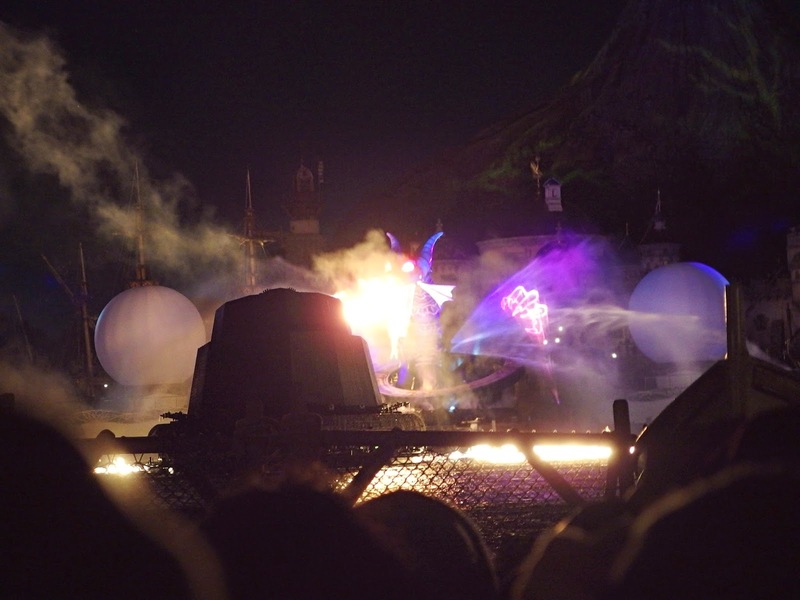 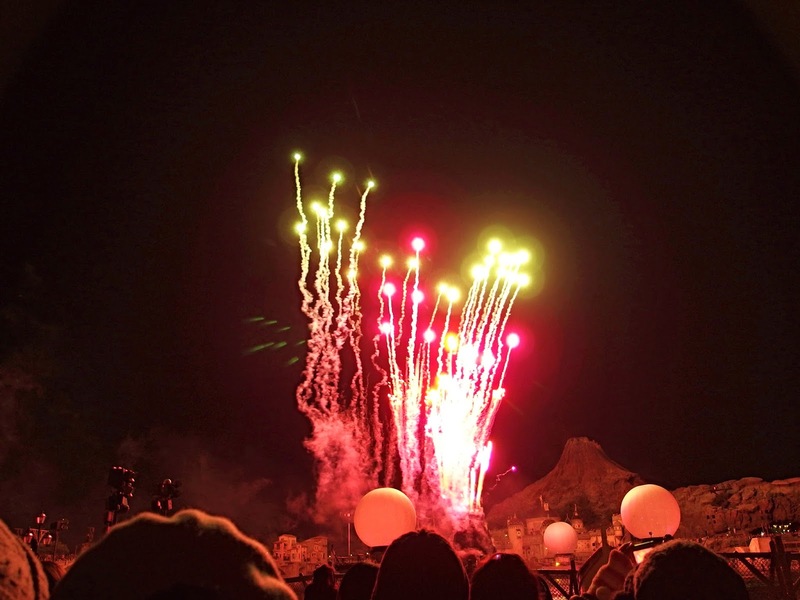 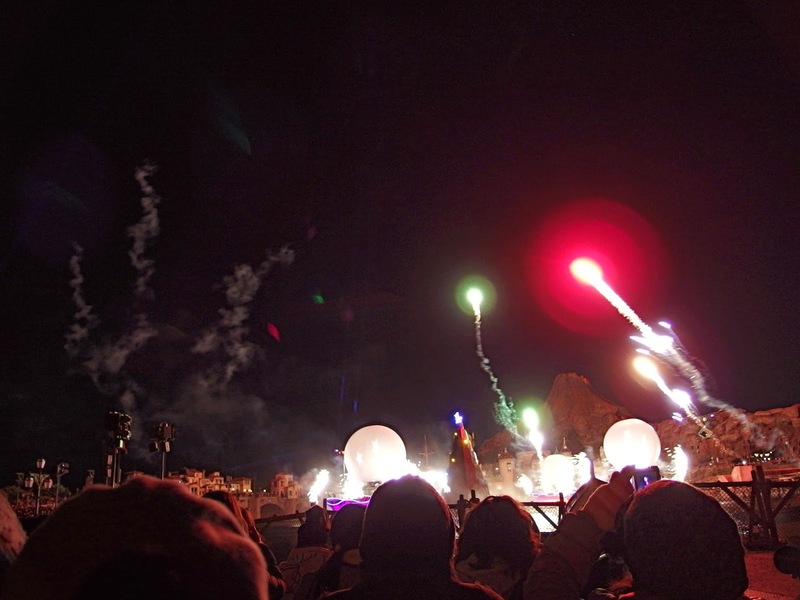 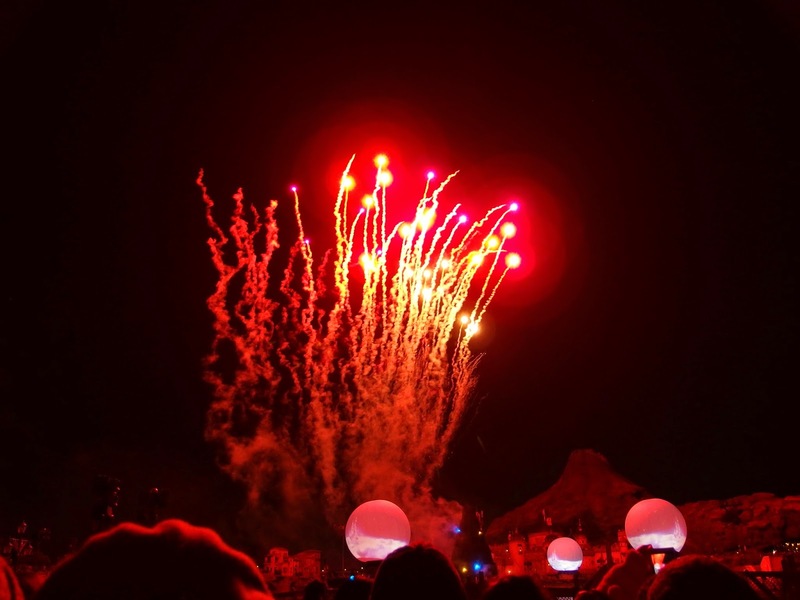 Intended to boost low attendance numbers at that park, the new Fantasmic show was also seen as a needed replacement for Sorcery in the Sky, an aging nighttime fireworks show. 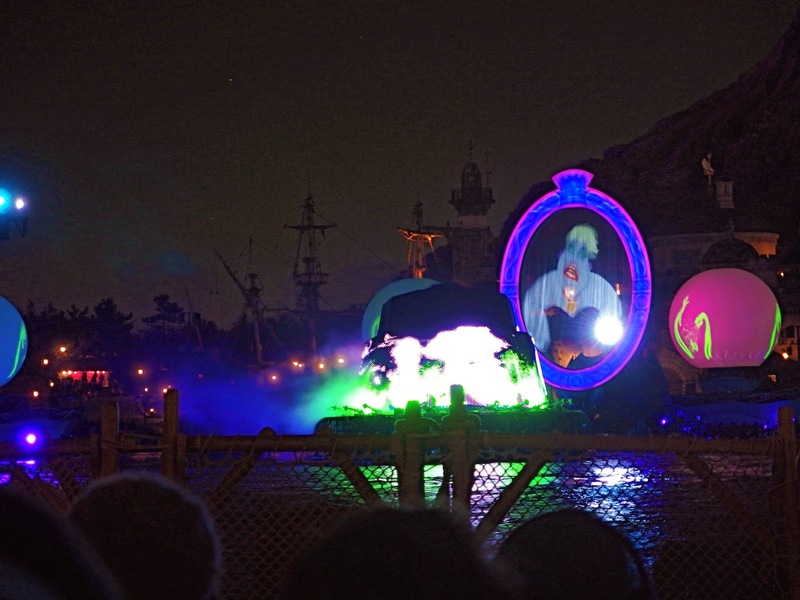 A third edition of Fantasmic! 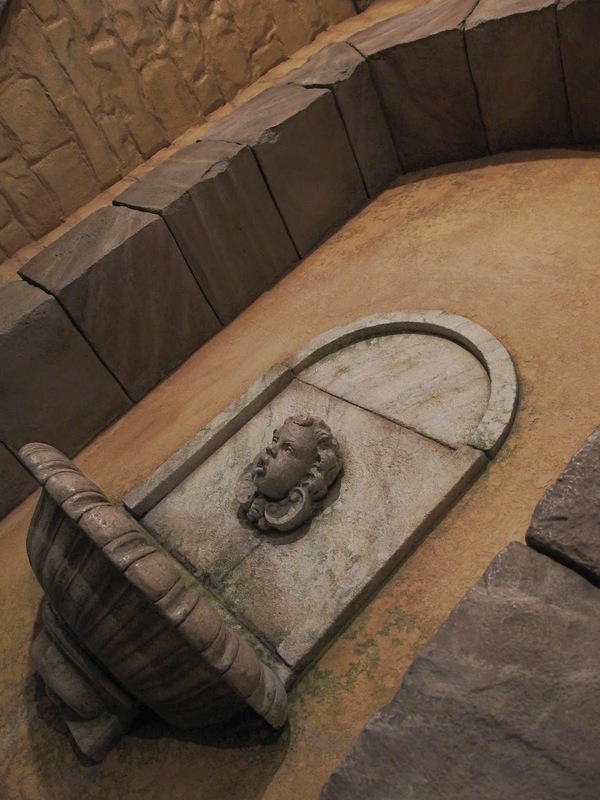 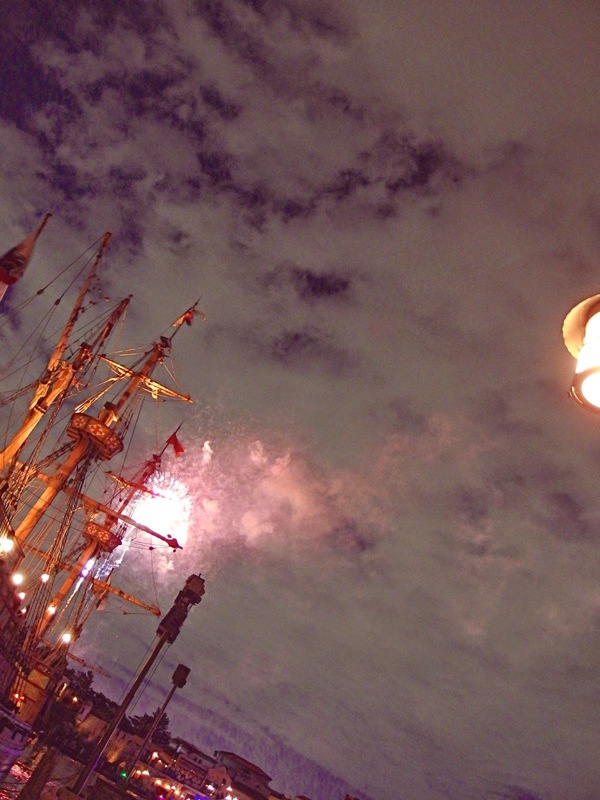 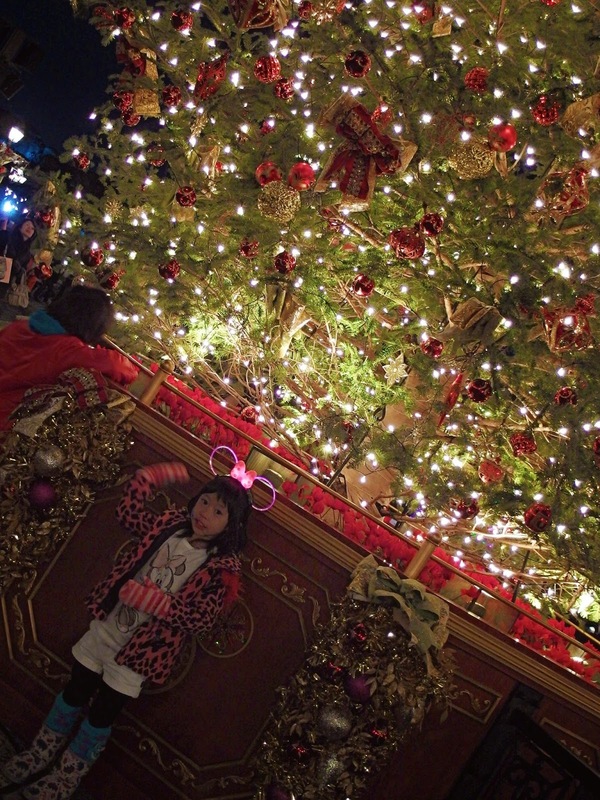 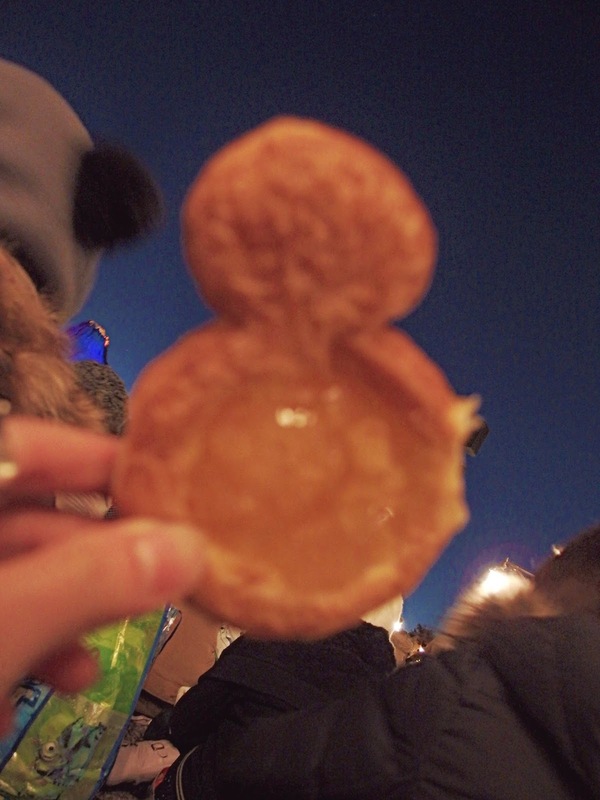 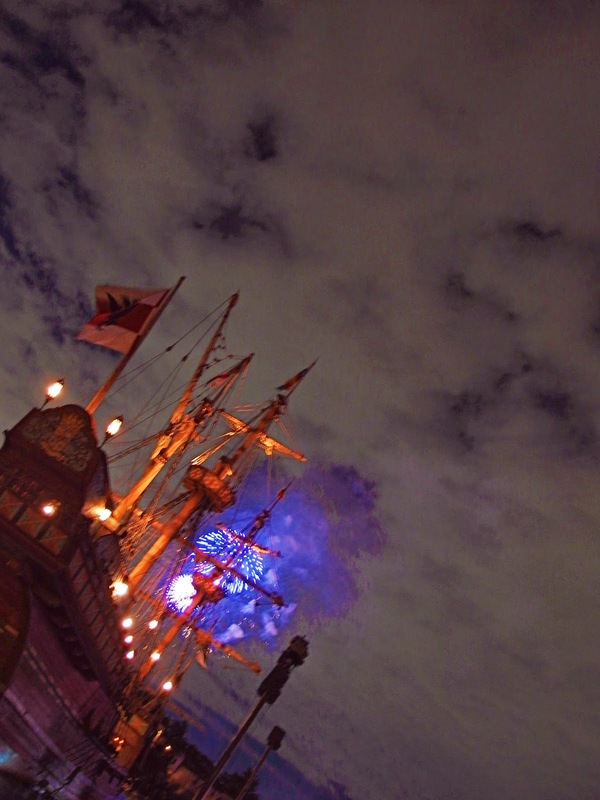 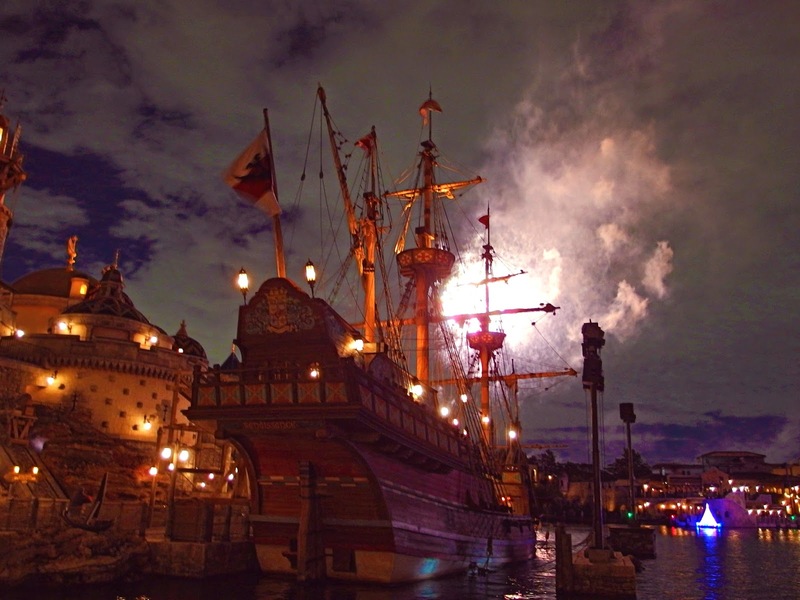 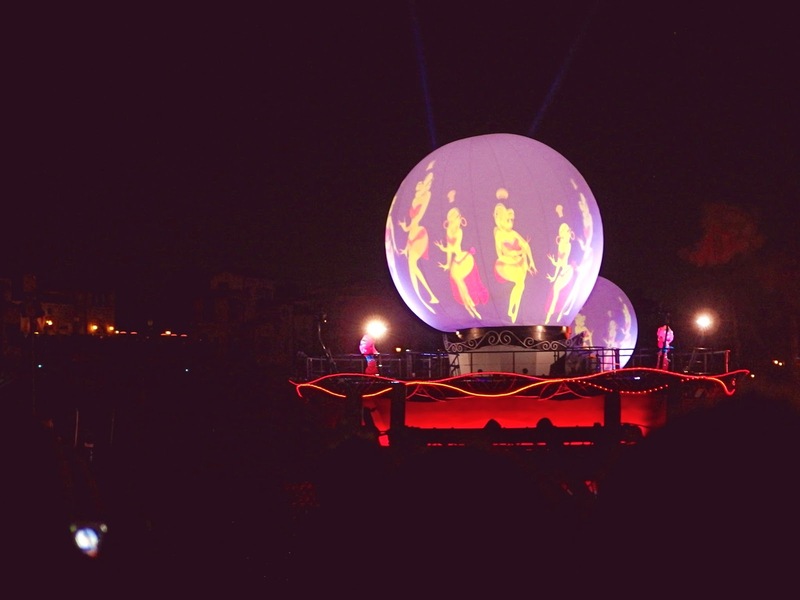 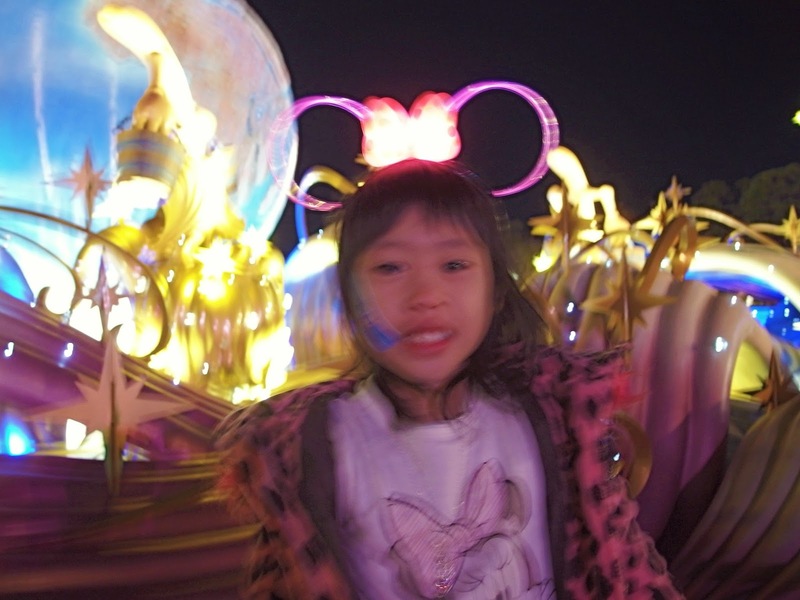 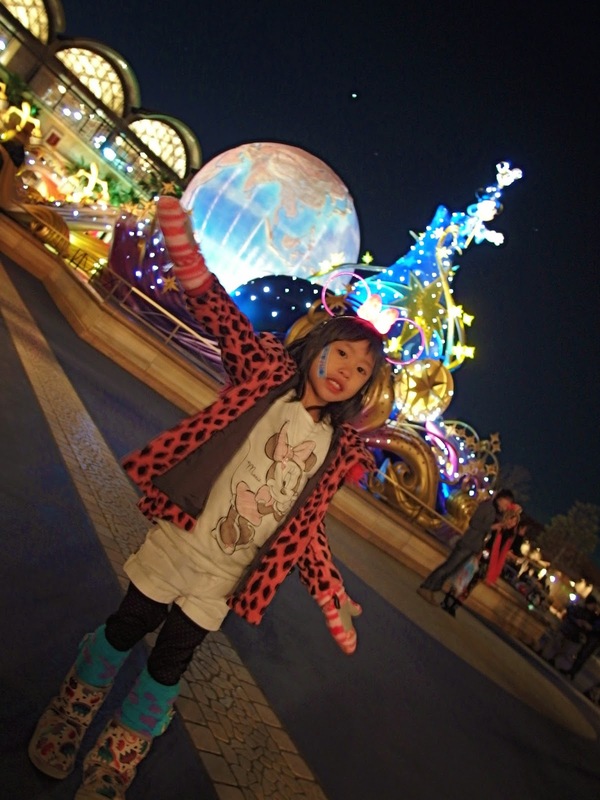 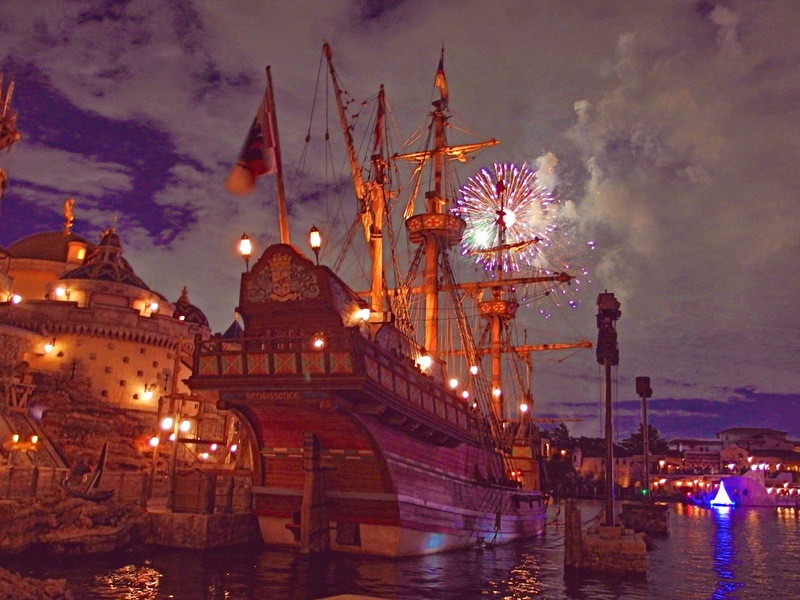 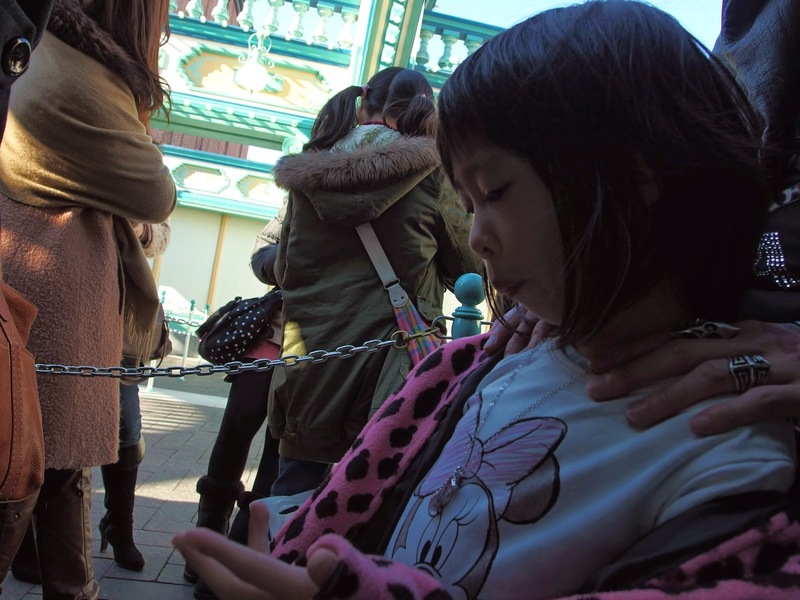 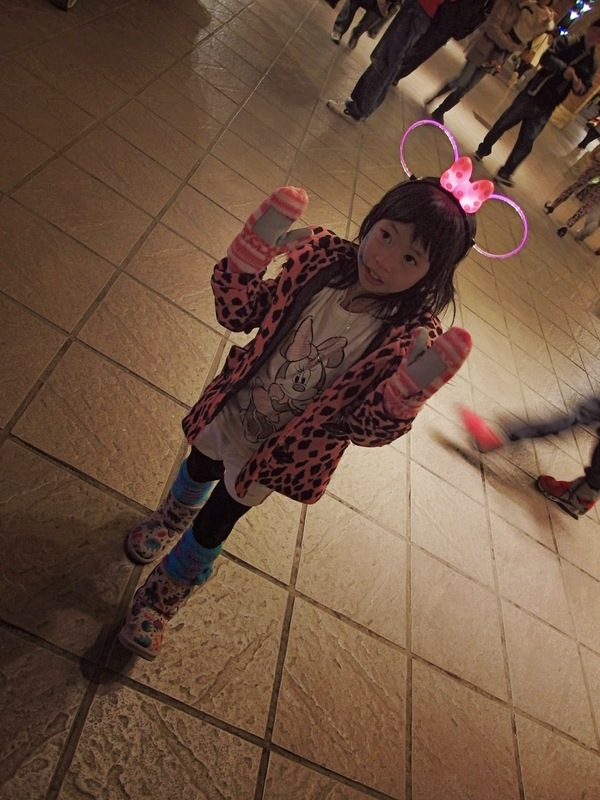 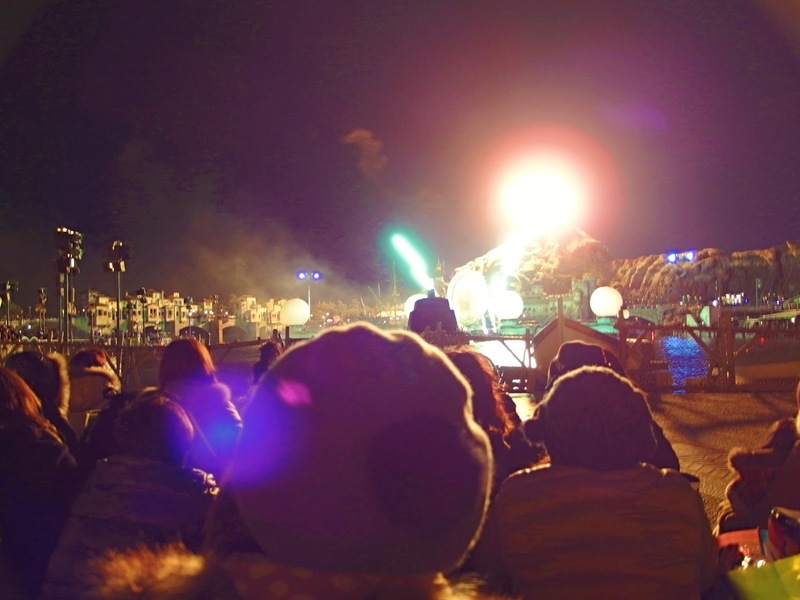 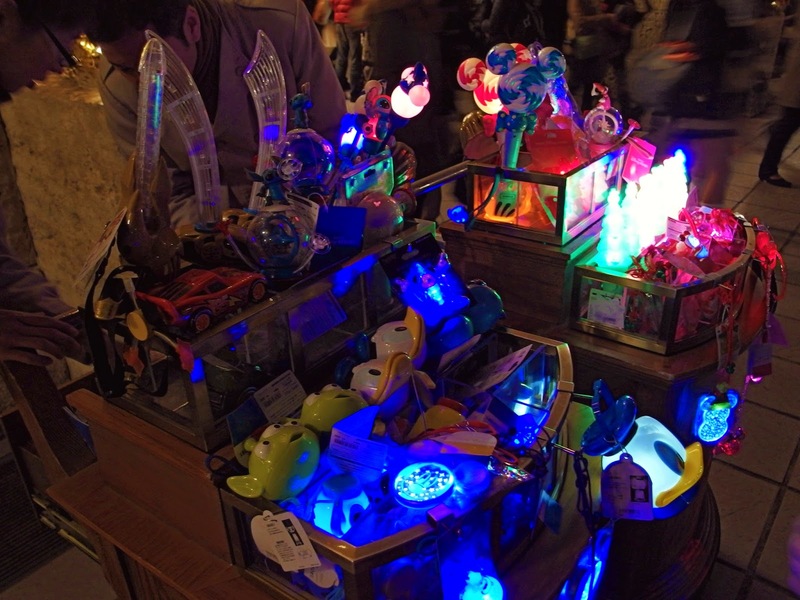 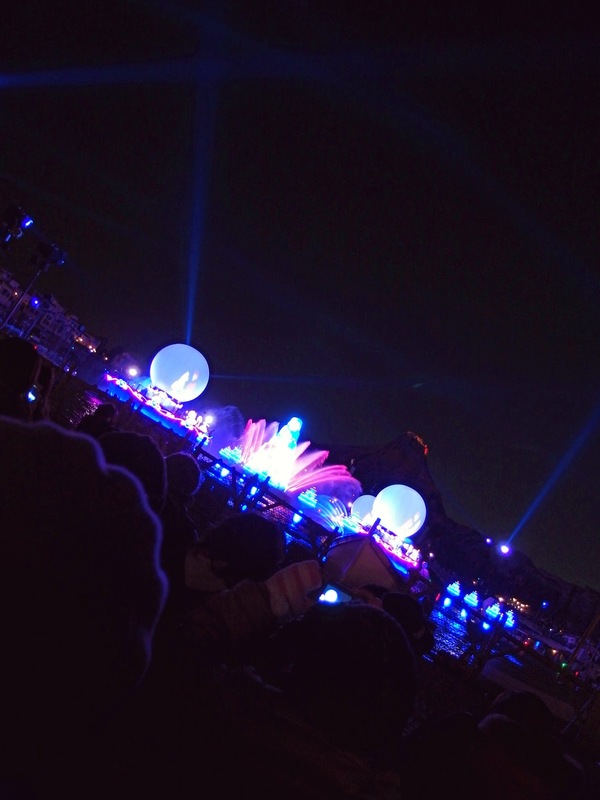 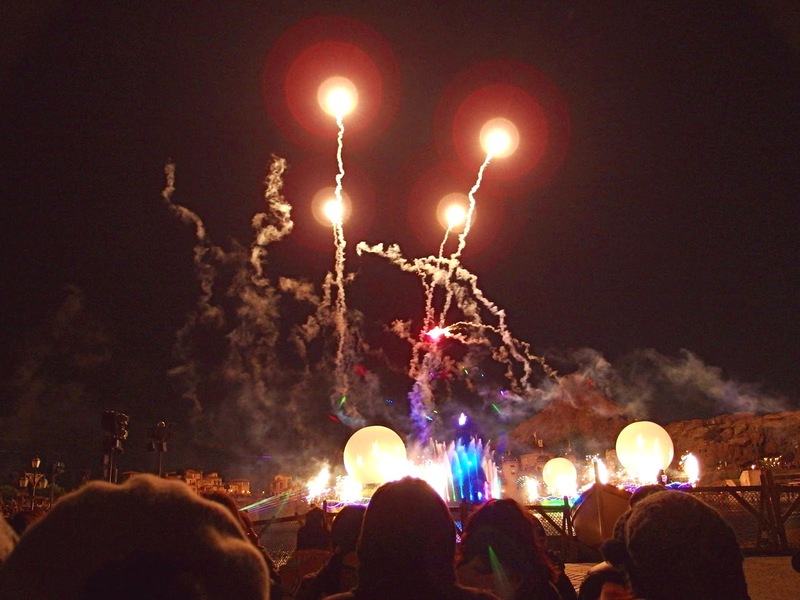 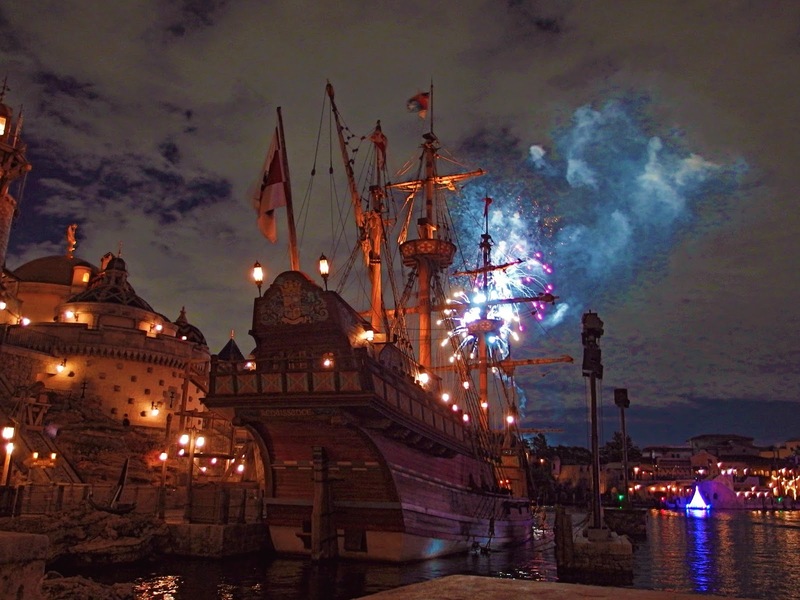 debuted on April 28, 2011, at Tokyo DisneySea in Japan. 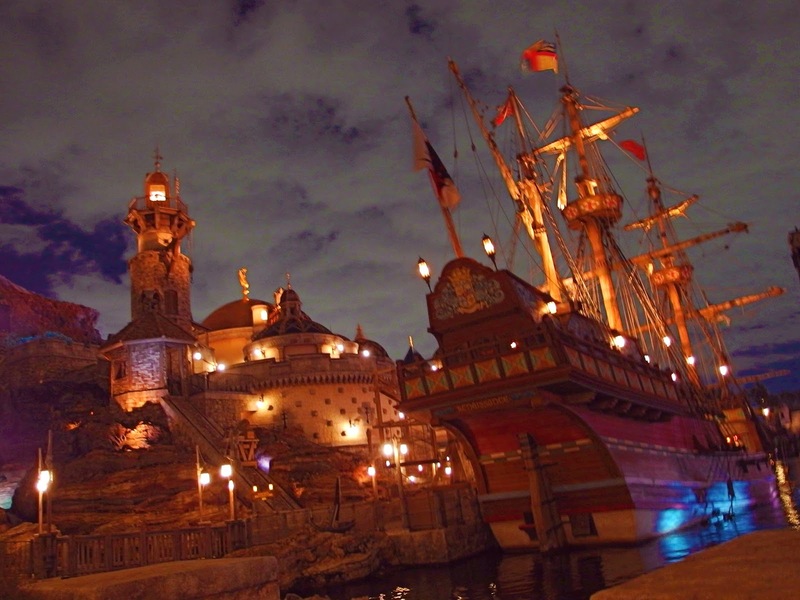 It features a new theme song and, being set in the Mediterranean Harbor area of the park, is done in the round with a series of barges, with a central “hat” stage for Mickey and other characters to appear from. 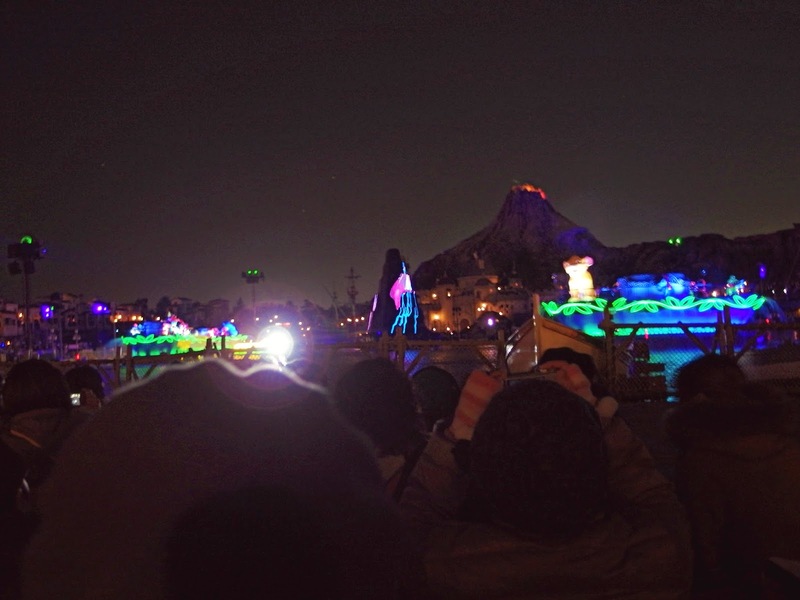 The show begins with the tune of the Sorcerer’s Apprentice as out of the stars, Sorcerer Mickey emerges on a tower of stars in a comet. 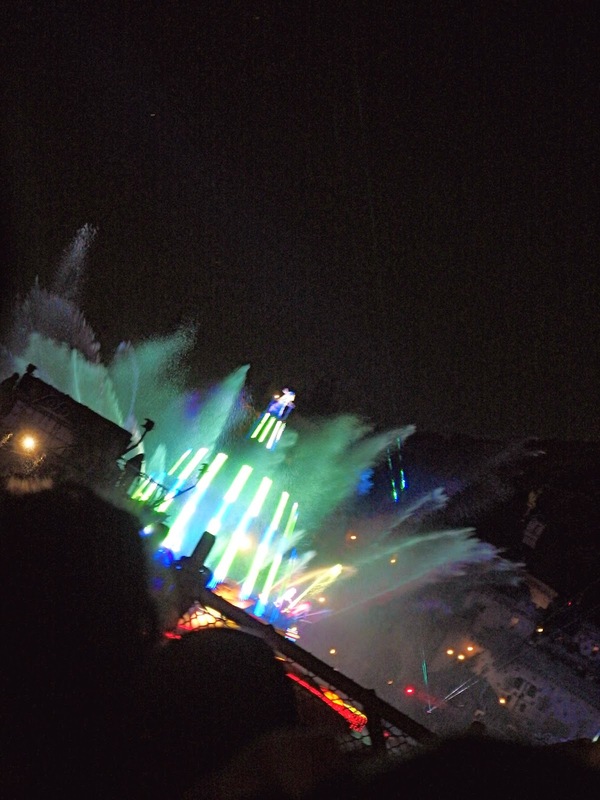 The new theme song, Imagination plays as Mickey conducts the water and images of different characters appear on the tower. 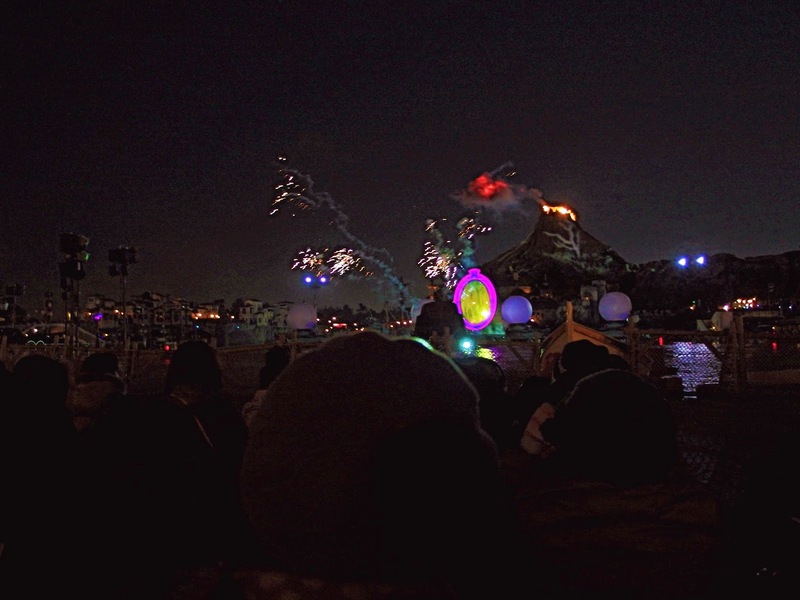 The music shifts into the instrumental Fantasmic theme and continues into Sorcerer’s Apprentice as Mickey conducts the stars and sea and calls on the Magic Brooms. 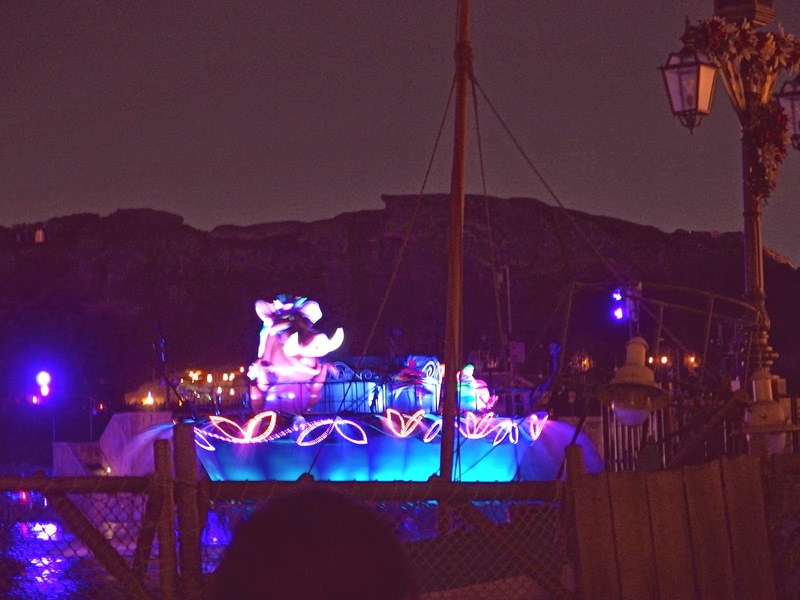 The waters rise and we enter the sea with Ariel singing Part of Your World, with Crush and his seaturtles swimming in the background. 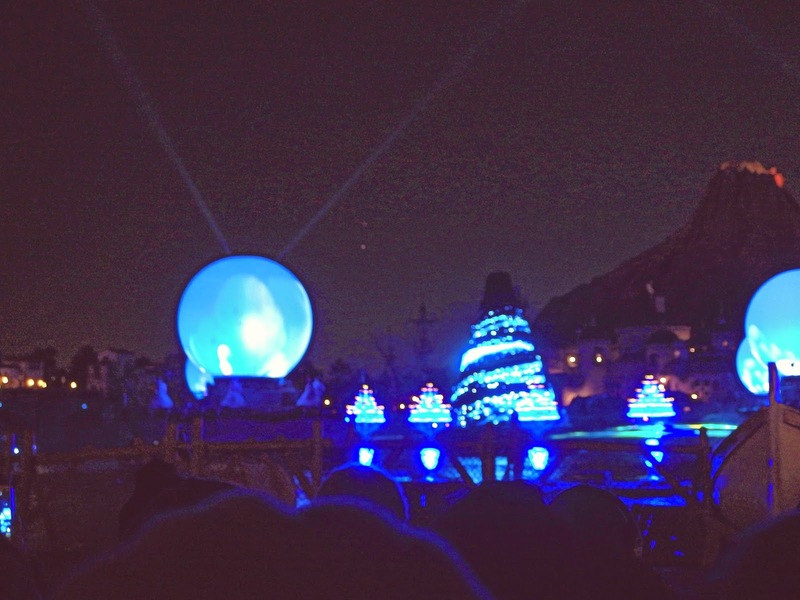 The dancing fish from Fantasia’s Nutcracker suite also appears as does Jiminy Cricket in his bubble, who pops it and fills the sky with bubbles. 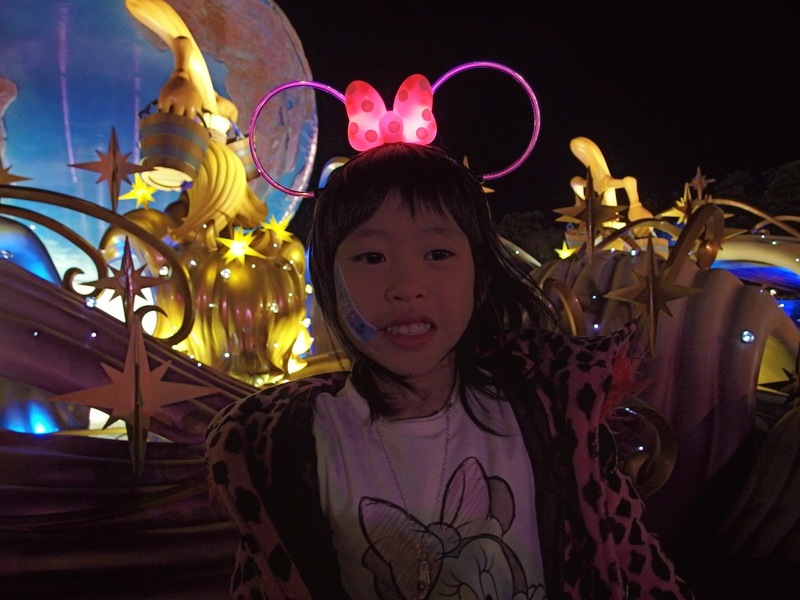 Mickey’s eyes appear in the dark asking what’s going on and the show enters the jungle. 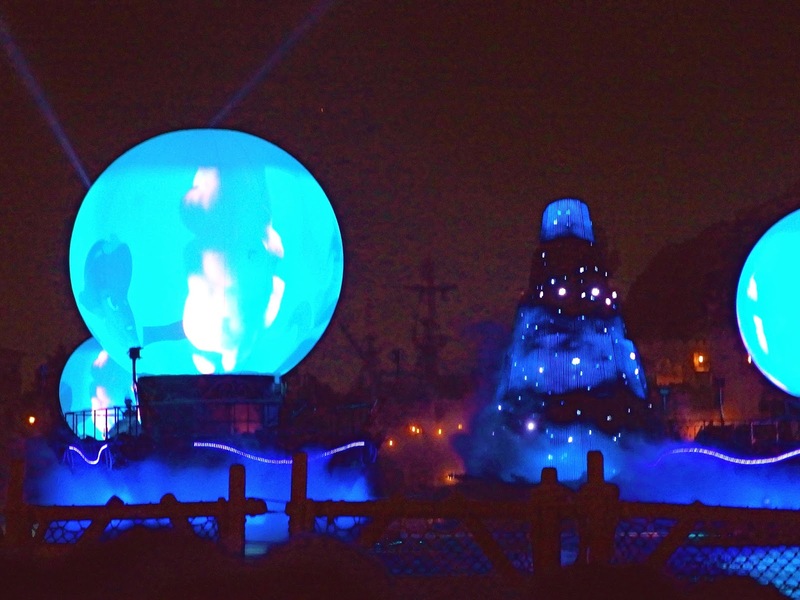 While Tarzan and Jane Porter appear swinging on the projection tower, floats featuring giant inflatable versions of Baloo, King Louie, Pumbaa and Simba as a cub appear along with a floating Kaa. 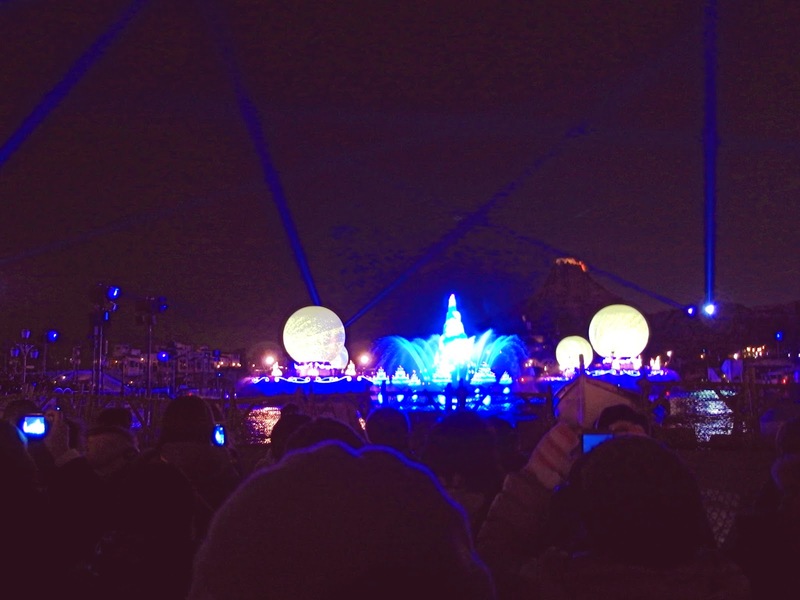 A medley of music from Tarzan, I Just Can’t Wait to Be King, The Bare Necessities, I Wanna Be Like You and Hakuna Matata plays, eventually building up into the Circle of Life. 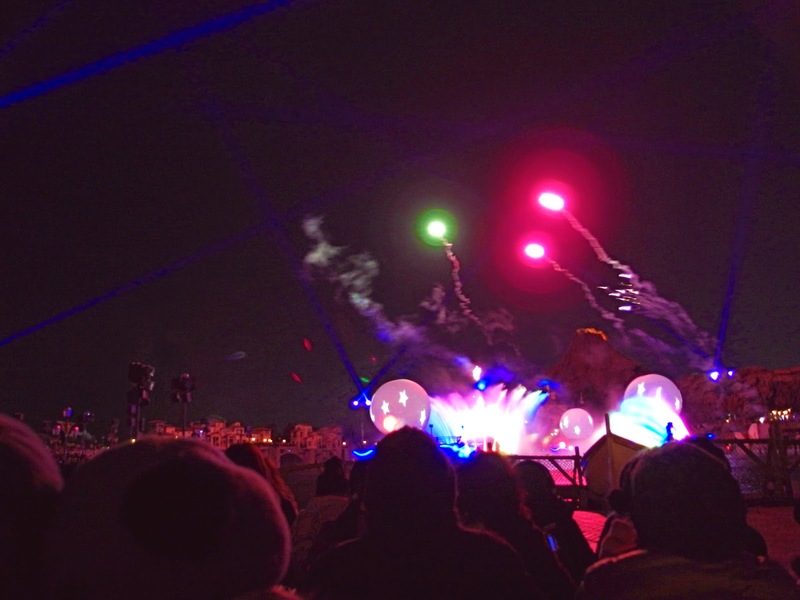 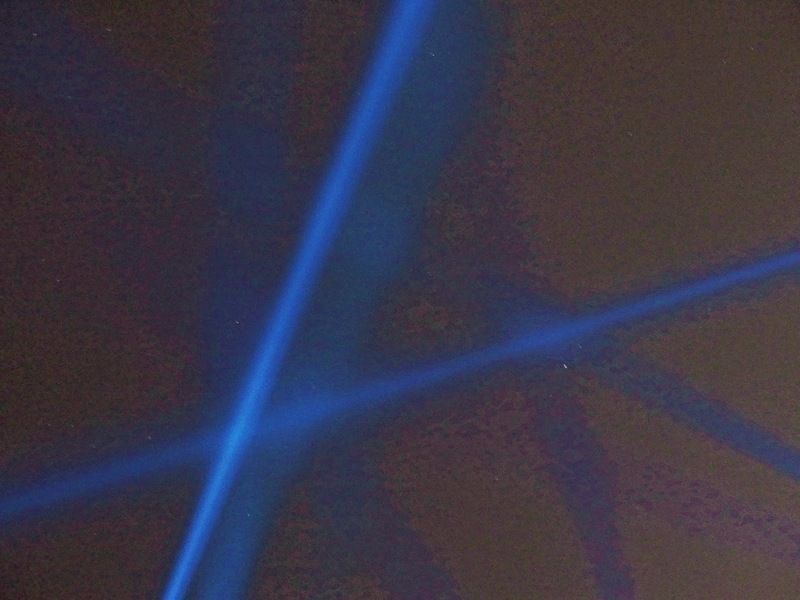 When Rafiki is about to hold up Simba though, Stitch appears instead (similar to one of the Inter-Stitch-al trailers of the film) and the music goes into an electric guitar version of Hawaiian Roller Coaster Ride with Stitch conducting the water while Angel pilots Stitch’s red speeder shooting plasma blasts. 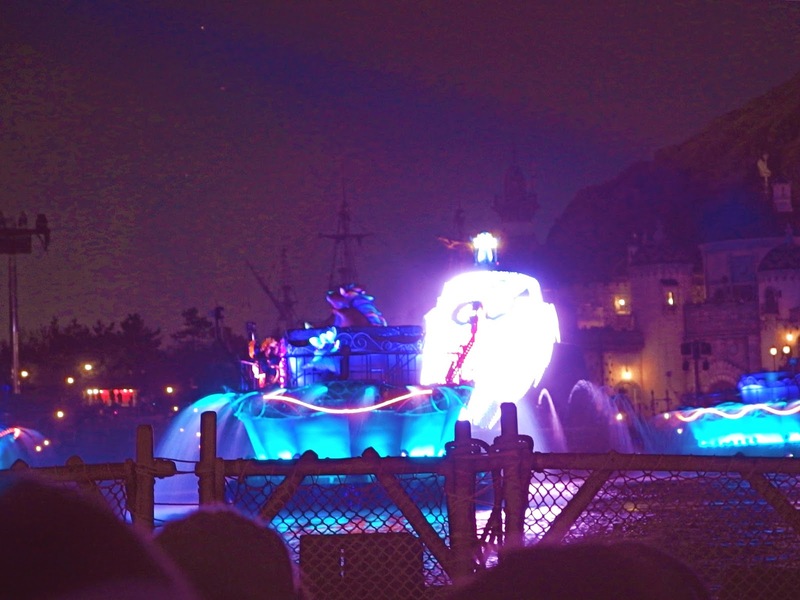 Mickey appears again, accompanied by the show’s theme song and When You Wish Upon A Star and sets the stage for an appearance by the Genie singing Friend Like Me as well as the scene of A Whole New World. 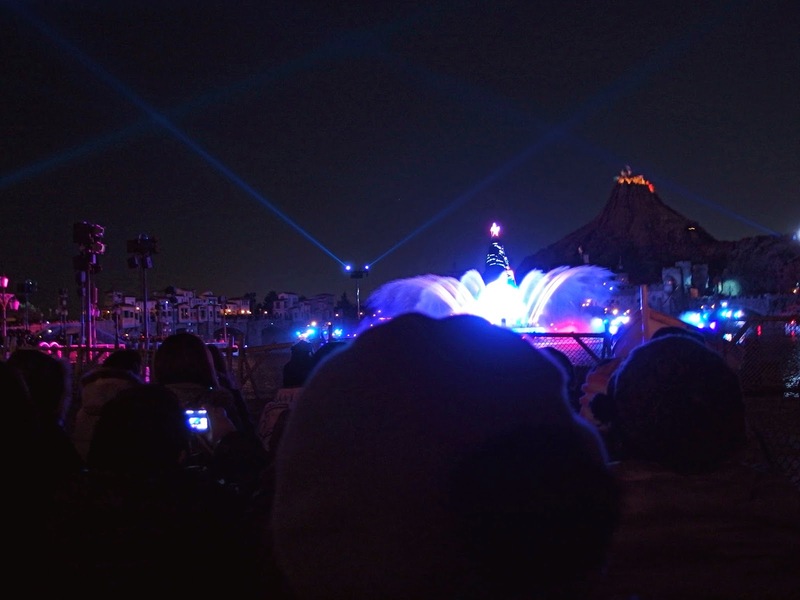 As Aladdin and Jasmine fly off, the music segues into Cinderella and a sequence based on the Disney Princesses. 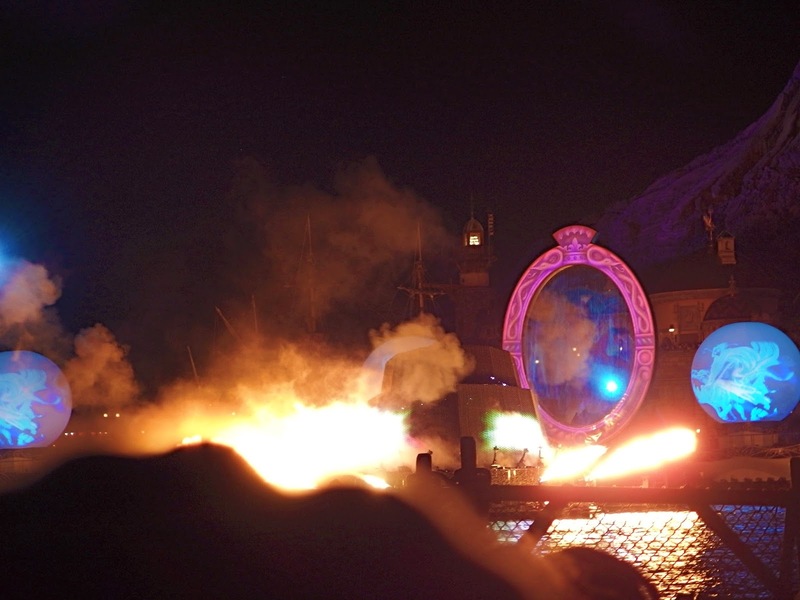 After the Princess medley, Mickey encounters the Magic Mirror and asks “Who’s the most powerful Sorcerer of all”. 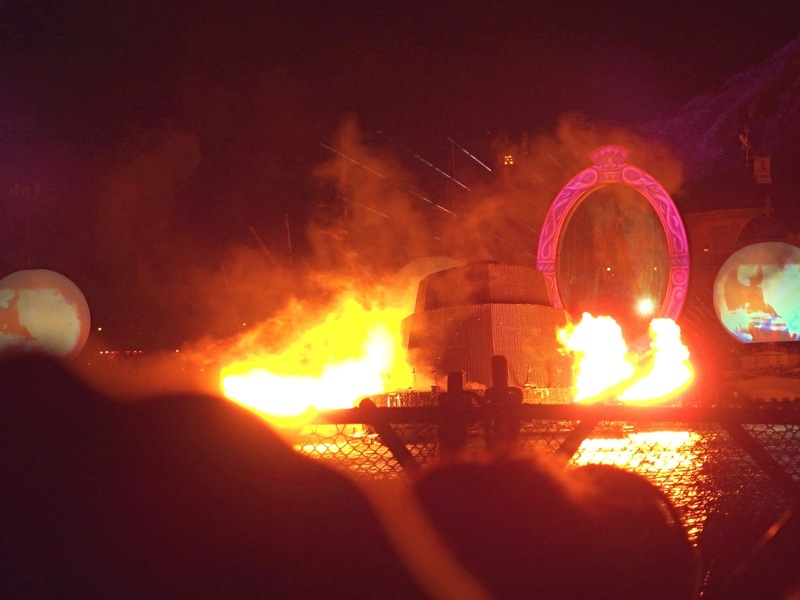 The Mirror tells him “True magical power lies within the mirror, gaze deep into your own reflection… Look closer… That’s it, closer…”. 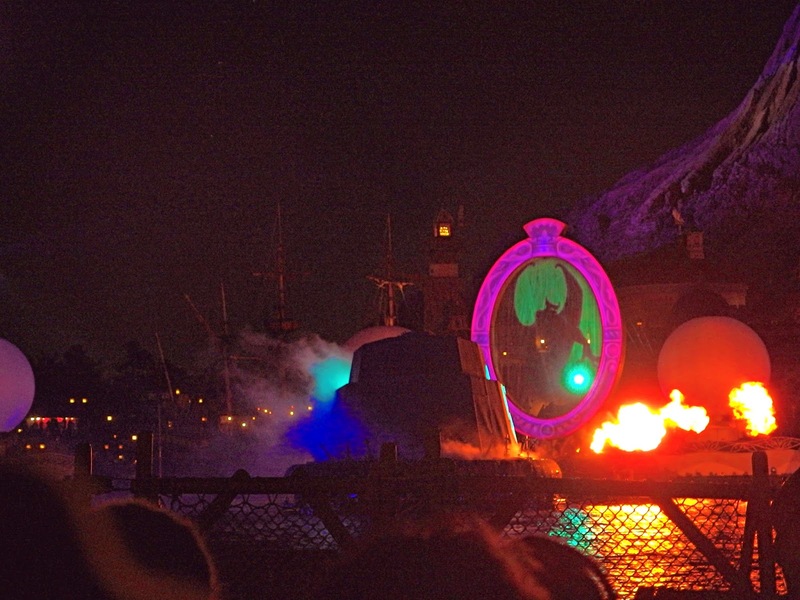 Mickey is then trapped inside, allowing the Witch and the villains to take control, each one appearing within the mirror. 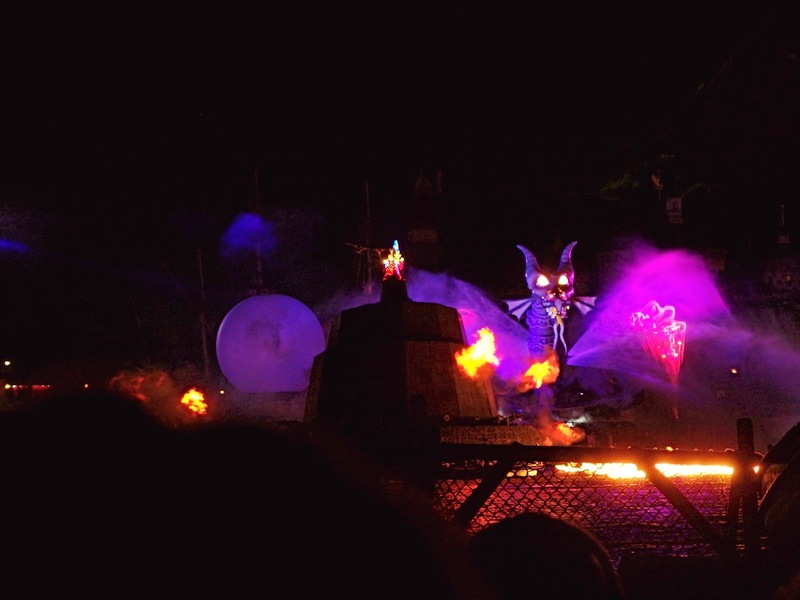 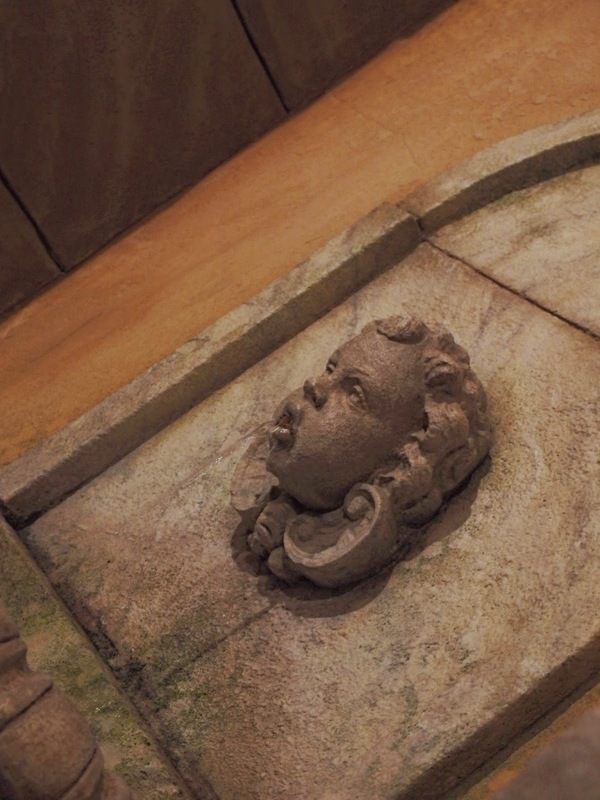 The Witch calls on the assistance of Ursula – singing “Poor Unfortunate Souls” and Chernabog -whose appearance is accompanied with a mix of Night on Bald Mountain and Hellfire. 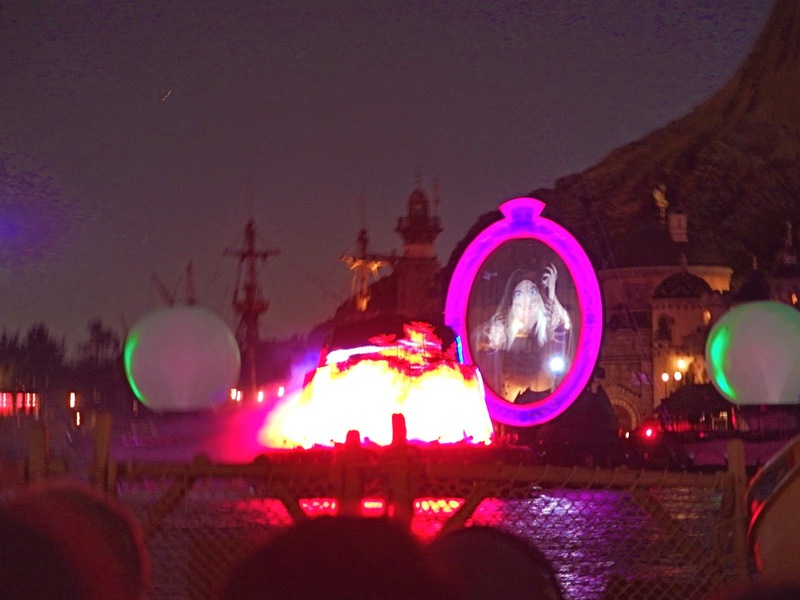 The witch laughs at the power of Imagination and the last villain emerges from the mirror: Maleficent who shows the power of her imagination by turning into her dragon form. 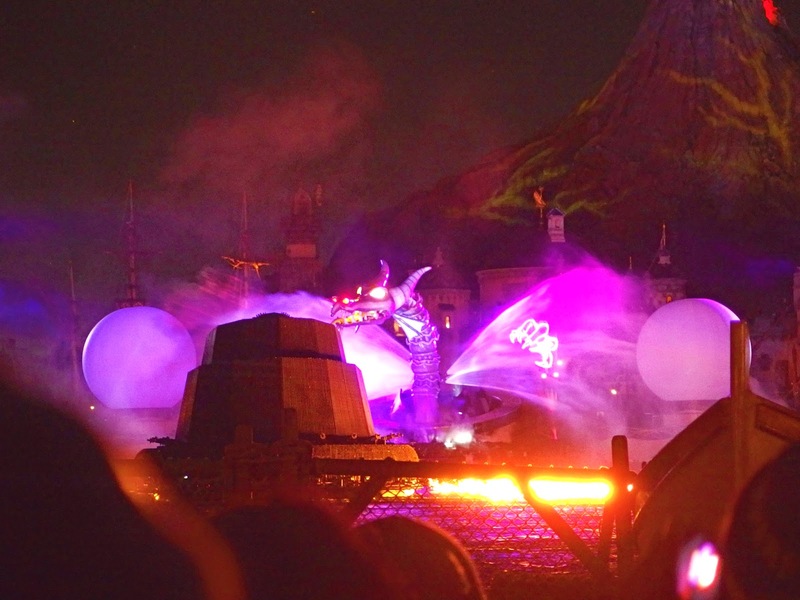 Mickey defeats Maleficent with his magic wand and the power of his imagination. 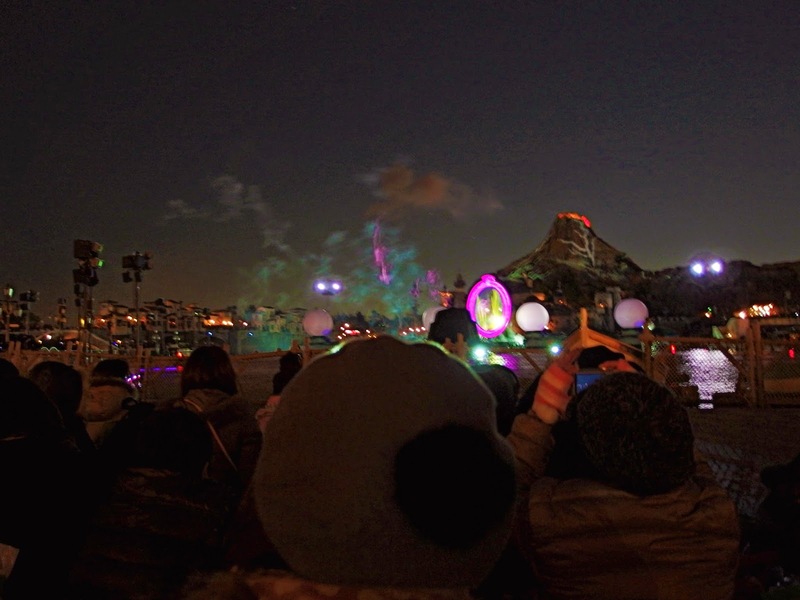 He falls back into his sleeping body and with a wave of Tinker Bell’s wand, the show moves into the finale, with a reprise of the song and many of the good characters appearing on the barges, including regular Mickey. 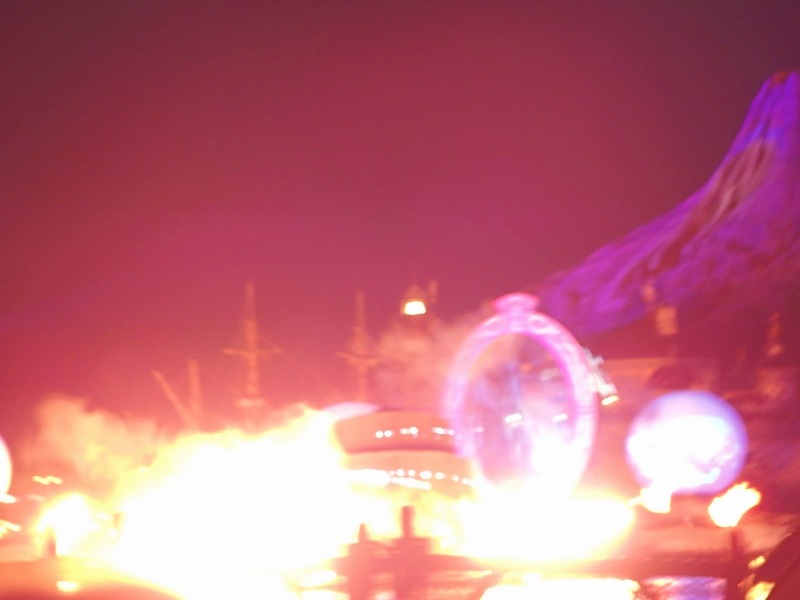 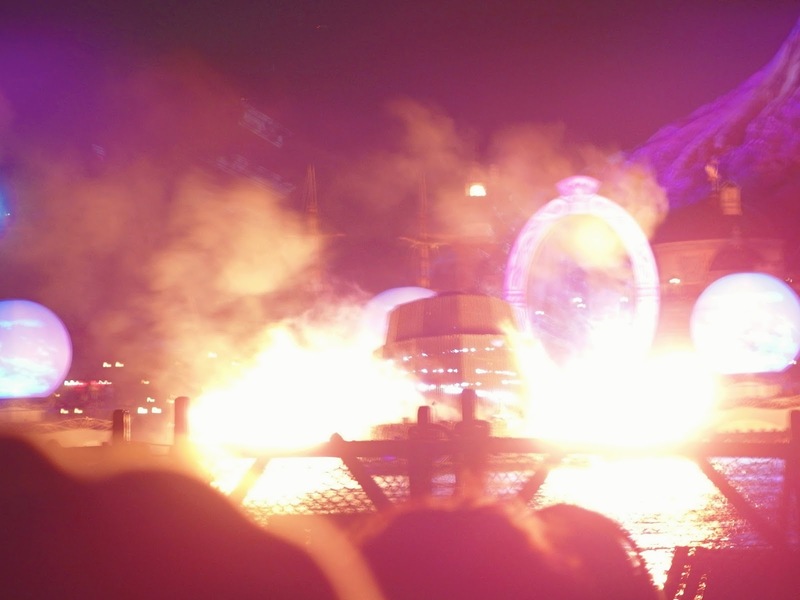 The barges stop and Sorcerer Mickey reappears on the tower, clad in a glowing white robe to conduct the final fireworks and fountains as the theme builds. 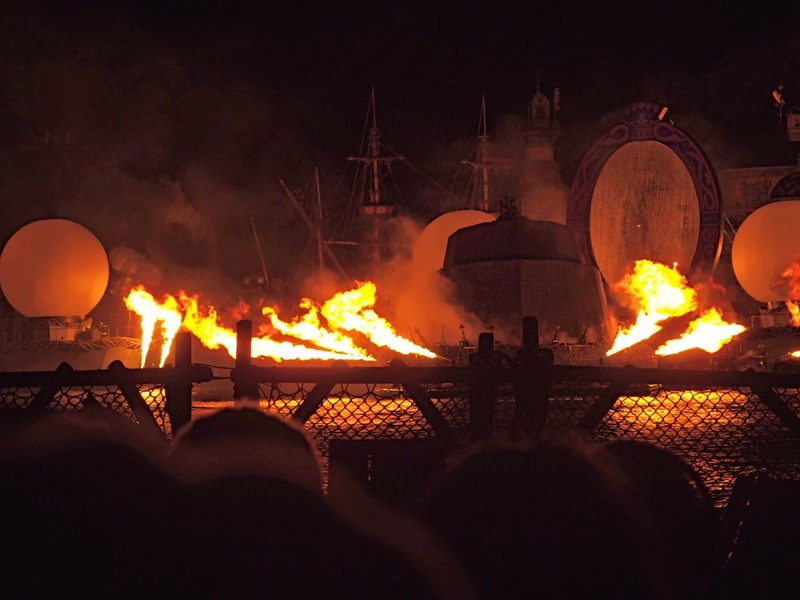 Mickey then remarks “Some Imagination, huh?” and disappears, with a few notes of the Sorcerer’s Apprentice theme and the final fanfare. 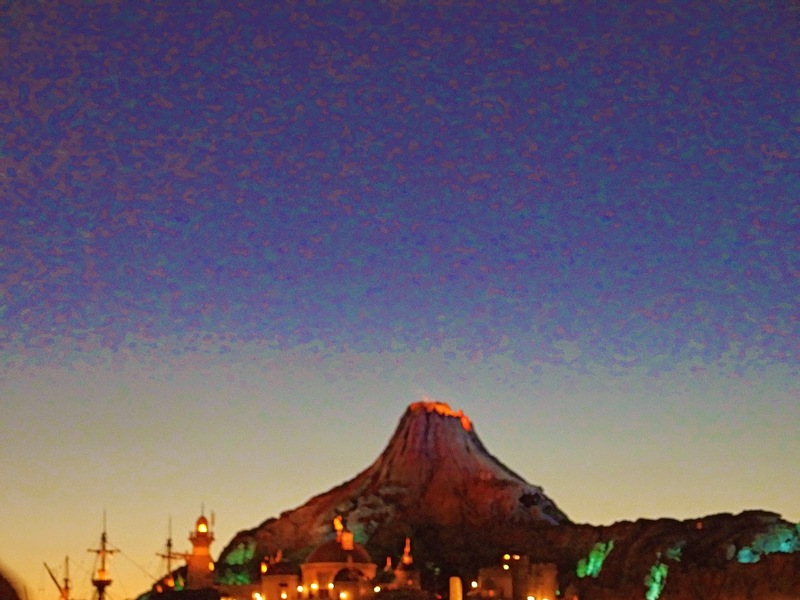 The tower takes on the appearance of the Sorcerer’s Hat and the exit music plays. 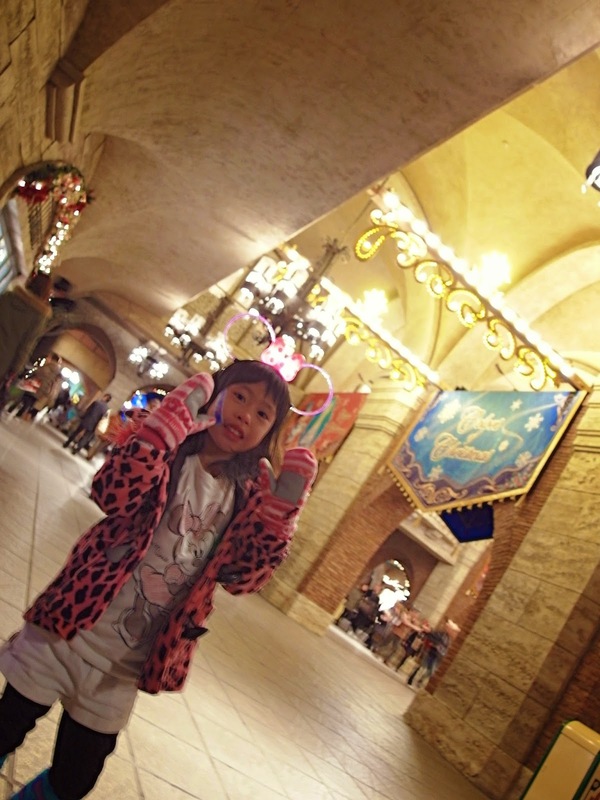 And check out how we spent our day earlier, HERE! 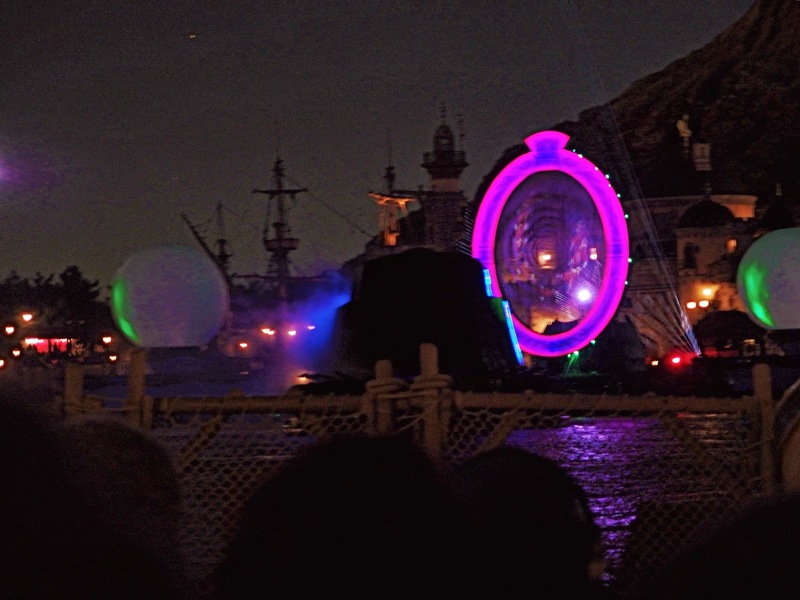 Here’re the rest of the pictures of the spectacular presentation! 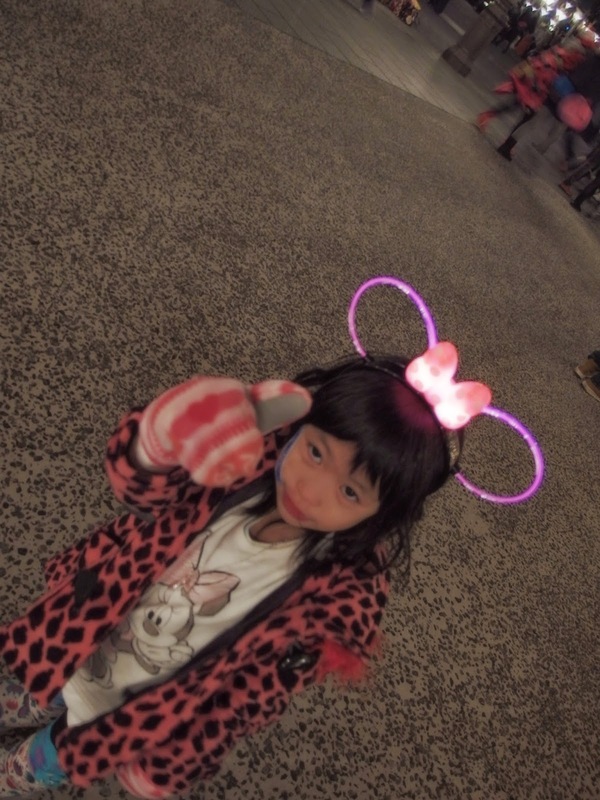 Singapore Night Safari [Part-2] Genting Highlands – Ripley’s Believe It or Not!